CLICK ON THE 'LARGE PHOTOS' BOX ON THE RIGHT TO FREEZE PICTURES I am available for consulting only on this particular property and/or available for strategic development guidance , representing buyers directly with the City. Price shown ($24-million) is a reflection of estimate of value that inflates with time, for a public resource only. 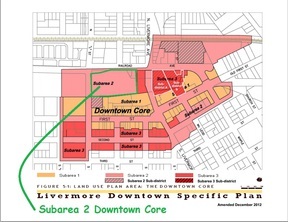 The property is owned by the City of Livermore. This is not listed for sale by my company. UPDATE JAN 10, 2018, I LIKE THE COMMUNITY GROUP FLIER OF JAN 10 2018, linked here. Regarding the acreage shown, basically I have been married to the property shown above through either a marriage of convenience or a marriage of inconvenience depending on how one chooses their perspective. My history on this property goes back many decades. 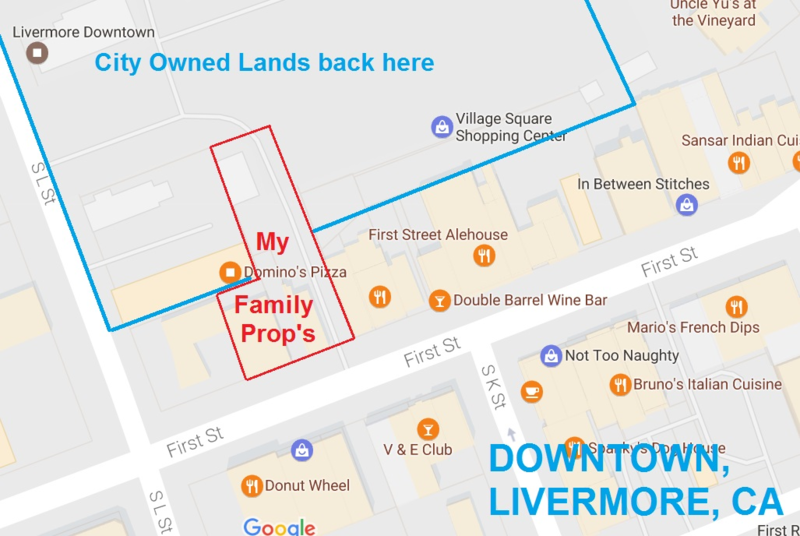 My family owns adjoining land and buildings...not much...but there we are... and our interest always seems to hook onto the above land owned by the City. 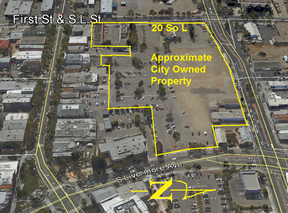 Indeed, we used to own a large chunk of the property we sold to the Southern Pacific Development Company who then built out the old (now removed) Lucky Shopping Center. Since I am in the real estate business, the family responsibly fell upon me to take care of OUR property somewhat, this requires me to be active and knowledgeable as best I can, on our surroundings. Thus over the decades, I have been everything from leasing agent for the adjoining Old Lucky Shopping Center Site (Subject Property) for the former owners of the above land, to sometimes-activist in our local community when horrible development plans were put forward (in my humble opinion) by a consortium of city officials and former city council persons, who while having the community's interest in mind, mistakenly tried ramming through development scenarios violating the higher trust owed to us locally, i.e., violating their promise to seek and coordinate local community input before proceeding. Their violation of the higher duty seemed aggressive and arrogant to everyone's detriment. I strive to remain reasonably in tune therefore, with planning, political thinking, and most importantly community preferences on the above shown Subject Property. Hence respectively, I offer to now to consult developers and/or buyers to help structure development plans that work among all vested interests, and do it with transparency. This obviously ties into my own family holdings so I care greatly what happens on the Subject Property. We do not expect to be the tail that wags the dog in planning matters but we do care greatly on how the city owned property is developed. 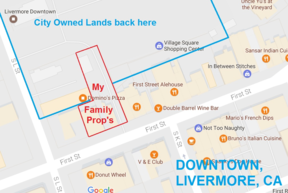 Most of the family was, for example, very supportive of the local community activists' plan shown above, with the attractive element of abundant open space, hotel, and much improved parking over anything offered up by the consortium. Price shown is a reflection of estimate of value for a public resource only and inflates with time. 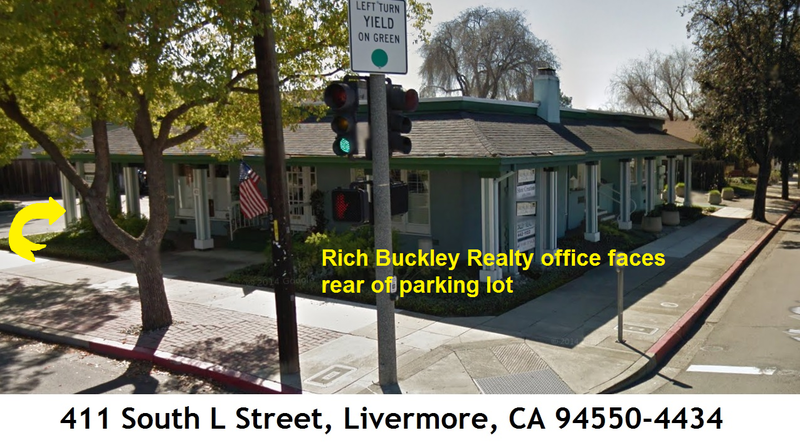 The property is owned by the City of Livermore. This is not listed for sale by my company. Keep lots of open space and wide sunny alleys on the residential component. Keep down the housing density and limit height to 3 stories. Allow the Master Developer to enjoy more flexibility as to choosing market rate residential housing components. Notice site plan changes that wide three areas and moves one of the South L entries 10' North to allow for landscaping and walks on both sides of the entry. Co-housing is a movement without a great number of followers and very hard to implement and will probably prove to not have sufficient effective demand in the market place to justify fronting the investment. There are examples around the SF Bay Area in Oakland, Berkeley, Richmond, and Marine County. Co-Housing is a group of residents sharing key areas like Kitchens, Living Rooms or Family Rooms and Dinning, with the participants taking turns doing cooking and other chores mutually agreed upon. Give the Master Developer freedom to retreat to housing types that the Master Developer is willing to do. But press for a larger Conference Center of at least 4,000 sq.ft. multi-purpose center. The large green belt and hard surface pedestrian walks through Plan A Westside, are excellent and will be energized with the West Side Hotel. It also integrates the old Groth Brother high density housing and pulls it into use with the downtown. I'd also like to see the Master Developer developing the Hotel, to be allowed to use more of the land if the Master Developer chooses, for hotel uses and parking especially with a 4000 foot conference center. I would like to see also a little pressure put on the Hotel component to provide 4000 sq.ft. multi-purpose conference center. 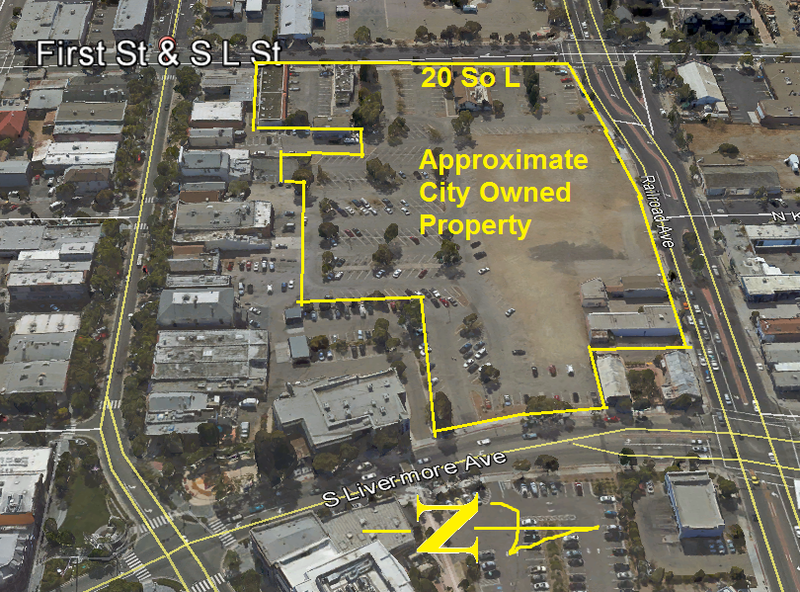 Also since the city's research shows nil demand for additional retail as a result of any building whatsoever on this site, I would again like to give the Master Developer flexibility to designate retail space as optional residential market rate space if the Master Developer so chooses. 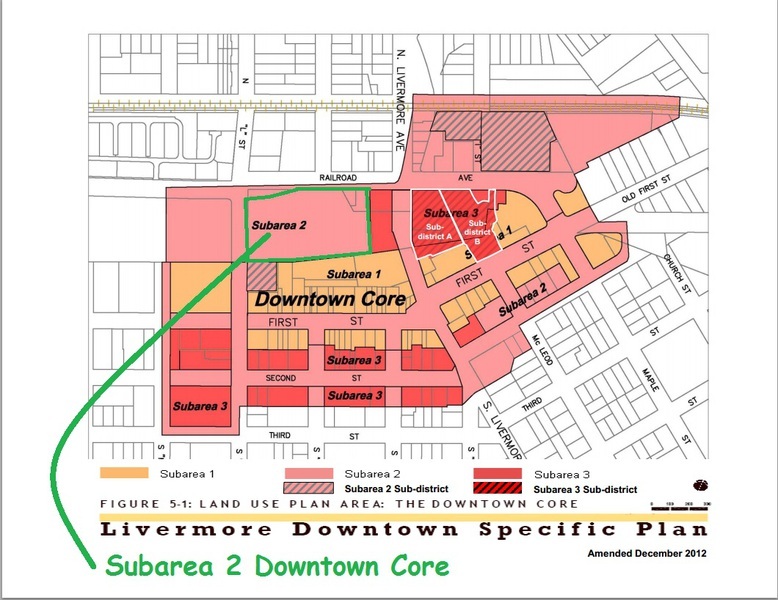 While no Master Developer has been selected, the city council has been introduced to a master developer with funds prepared to build the hotel, handle the residential components and work with the City and the Community Group and other vested interests to bring the parties together around the West Side Boutique Hotel his company would develop. The parking distribution on the West Side Plan-A looks good and will reduce traffic congestion during peak use hours. I much prefer the curved drive perhaps with speed bumps over the straight through road. Move the South L Street Entry Road North 10' and provide landscaping and walks on both sides of the entry road as shown on my MODIFIED Westside Plan A, inserted below. Finally it should be noted that there is a deal available for the mere asking from the Rodeo Association that would relieve much of the housing requirement off the downtown property and transfer residential building placement over to city hall grounds onto unused land. Historically the City Hall was our old Rodeo Grounds. When the Rodeo Association transferred the property to the City it carried a deed restriction that the Rodeo Association has publicly offered to remove for the token recognition, much deserved IMHO, that the open space parkway, pedestrian center such as the West Side Plan A satisfies, that there be a formal dedications plaque-art work-statue memorializing the Rodeo Association's historic and current contribution to the community, which seems most reasonable to me. The importance of this is that it helps satisfy housing obligation we convincingly and wisely rejected known as the Lennar Plan. Sub Type: Mixed Use Res./Com.